Discover Riga, one of Europe’s most beautiful and most affordable capital cities! Riga was ruled by Russia for more than 250 years, and Russian is the first language for more than 40 per-cent of the population. Latvia is, however, part of the EU, so many students will not require a visa to study on a Russian course in Riga. After your Russian lessons, enjoy a walk down the winding medieval streets of the old town (Vecriga), which hide cosy cafés and atmospheric bars. Spectacular church steeples and impressive modern structures share the city’s skyline, with the tree-lined banks of the Daugava River completing the picture. Take the elevator to the top of St. Peter’s Cathedral for magnificent panoramas of the city, or look out from the top of the Riga Radio and TV tower, the third highest tower in Europe. A rich history, various music and cultural festivals, one of Europe’s largest markets and excellent cuisine - Riga has something for everyone! Our Russian language school could not be better positioned, right in the heart of Riga. The National Opera House and main train station are close by, while the old town is a short, pleasant walk away. The school has comfortable, well-equipped classrooms, a student lounge, inner courtyard and a computer room, complete with wireless Internet access. The Standard Russian course in Riga comprises 20 group lessons per week, Monday to Friday. Covering speaking, listening, reading, writing and grammar, the course will quickly improve your general understanding of Russian! The Intensive course is also taught in same-level groups, but provides a greater emphasis on conversational skills. Design your own course with Private Lessons, which give you complete control over the curriculum and timetable! Combined courses are also available, so you can reinforce Russian learnt during group classes. On the Evening Courses, Russian lessons take place in mini-groups, with a maximum of six students per class. If you need to learn Russian in Riga for professional purposes, our school’s Business Russian course will be ideal! As well as business vocabulary, you’ll also learn how to correspond, negotiate, perform presentations and communicate effectively in Russian. Fully immerse yourself in the Russian language - live with one of our school’s Russian-speaking host families! You’ll be provided with a single room, breakfast each day and plenty of Russian practice! If you’d like a private bathroom, choose a premium host family (outside of the city centre) or an executive host family (located close to the school). Our school can also arrange inexpensive hostel accommodation for you, including a hostel in the same building as the school! Enjoy our school’s varied activity program whilst you learn Russian in Riga! First of all, a walking tour will introduce you to the city and its sights. 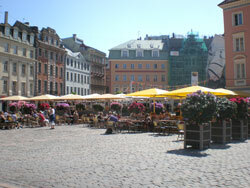 Other typical activities include meals in local Russian and Latvian restaurants, trips to museums and the Central Market, ten-pin bowling, concerts and movie nights. You may even be lucky enough to visit the stunning white sands of Jurmala. One-way and two-way transfers are available with our school, although they are not included in the cost of your course. The classes were very good, films and photo's from youtube etc. were used in addition to books, this was attractive. My accommodation was very clean, with a caring hostess.